Can the City Council help bring startups to New York City? New York City may be the city that never sleeps, but as far as digital entrepreneurship goes, on paper it looks like the city may have taken a nap. Out of the 500 fastest growing tech companies, NYC only has six. In the first half of 2008, New York City startups raised $926 million in venture capital. Nearby (and much smaller Boston) had more startups, that raised $2.6 billion in the same time frame. The Bloomberg administration would like to change that, and is fostering a few programs to do so. Yesterday at City Hall, the City Council held a hearing to address some of the issues that have been hoding New York City back and what can be done to improve the city’s standing amongst other urban capitols around the country. While there may not be a silver bullet to bring New York City’s startup culture in line with Silicon Valley, the meeting was an eye opening look into some of the challenges at hand. First off, there is clearly an active tech community in the city. According to startup lawyer Heather Mills, there are more tech employees here than in Silicon Valley. The Bloomberg administration, for its part, is trying to help. Incubators like Hive@55 offer affordable office space for freelancers and entrepreneurs around the city. The NYC BigAPPS contest is currently offering $20,000 (and lunch with Mayor Bloomberg) to whoever can best deploy the city’s store of information into a funcational mobile application. But the first thing that became clear yesterday morning is that there’s a long way to go. Taking place at City Hall in New York City, the Council Chambers room was equiped with WiFi. There was also a Twitter feed to follow and the entirety of proceedings were livestreamed. And early on, many attendees were frustrated with the proceedings. It was a hurried meeting, and speakers like Hermann Mazard, “chief enthusiast” at digital grocery list HomeShop, questioned the city’s commitment to technology entrepreneurs. It soon became clear that the Technology in Government Committee is not attuned to the city’s technology community. To fix that problem, they had invited around 30 entrepreneurs, venture capitalists and educators to speak on the hurdles they face working in tech in New York City. More than a few suggestions were thrown out, including tax incentives for investors, more office space, more courses to train workers and more infrastructure generally. pay don’t help entrepreneurs heavy on ideas but short on cash. space to them. They just want to get started with the business of doing their jobs. Simply helping to fix communication will be a big step way toward making New York a more open city to new businesses. As the tech community spreads out around the city, it may no longer fit into a collection of streets that can be found in Silicon Alley, but the idea behind that concept, that New York has a focused and vibrant new media community, is one that can continue to grow. Because showing a committed interest in a fledgling community is a big step toward growing it. A major disincentive for individuals looking to start businesses is perception. The high cost of living in New York, limited space and the cost of finding capable employees can deter individuals looking to start a business here. But New York has plenty of native resources that make working in the city a boon. If the city can tap into that and actively show that they care about innovation, it will go a long way toward figuring out how to get things moving in the right direction. News readership may be up, but as anyone with a media business can tell you, the method of deploying that information is getting more problematic. And one of the businesses that has been receiving obituaries the last few months is the RSS reader. But rather than an abrupt death, the RSS reader seems to be going the way of search, and ceding marketshare to Google. Which might be even more depressing. Lady Gaga may have only earned $167 for 1 million plays of her Pokerface on Spotify this year, but there are still ways for musicians to make money from their music online. The workhorse for the music industry has long been live shows, with concerts bringing performance earnings as well as providing marketplaces for sponsorships and promotional items like tshirts, CDs and posters. 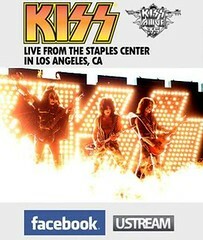 As Kiss’ recent live UStream concert showed, there are a lot of people poised to make money from bands online. The average Internet user is now spending 13 hours online per week. And chances are 50/50 they bought something online this past week, too. double the tally from earlier years. These and other findings come from a recent Harris Poll.